Fix alligator cracks, shallow holes, and cracks wider than 1/2" easily. Buy 1/2 pallet or Full Pallets and Save Huge! This simple alligator patch is an economic solution to heavily cracked asphalt—you no longer have to resort to a complete asphalt overlay or full replacement for multiple cracks. This product also doesn't require any heavy equipment; all you need is a squeegee for application. This easy repair process allows you to have your repaired areas traffic-ready in 2-4 hours, given favorable conditions. It is important to not use Gator Patch when precipitation is in the forecast, when the asphalt is wet, or when the temperature will be below 50°F. Simply prepare your asphalt as you would for any other task: remove any dirt and debris from the surface. We recommend using our Ryno Crack Cleaning Brushes, Billy Goat Grazer or Heat Lance to get the best results. After ensuring the asphalt is clean and dry, you can begin to apply the Gator Patch. Simply mix / stir the patch as per instructions—simply pour some of the product onto the cracked asphalt and spread it in using a squeegee. For wide cracks (1/2"-wide or more), make sure the patch is flush with the surface by using a squeegee to remove the excess. Once Gator Patch is cured, the patch seals the asphalt against water and chemicals—even in low-lying areas and dips where water collects. It withstands any climate once cured. We recommend sealcoating the surface 48 hours after the Gator Patch installation for improved durability. This product is compatible with coal tar asphalt sealer and regular asphalt sealer. After Use: Wash squeegee and all used tools with soap and water. If product has dried on the tools, use a solvent. To Store: Do not store Gator Patch in direct sunlight. Do not store in temperatures over 100°F. Container must be closed when not using. Keep out of reach from children. How long does it take Gator Patch to dry when it's 60°F? At that temperature, expect it to dry in 3-4 hours. It will continue to cure for another 24-48 hours, after which time you can sealcoat over it to help with durability. Can I put down sealer before gator patch? Do I need to seal the area treated with Gator Patch? You can put them down in either order; however if you put the Gator Patch down first and then sealcoat over top of it for a more uniform finish. How much Gator Patch should I apply? It's like peanut butter on toast: you want a layer that covers pavement and seeps into the cracks, but not so thick that it's all Gator Patch and no pavement. The longer your strokes, the more visually appealing it will be when it dries. Use a hard trowel or a stiff squeegee to smooth it on evenly. Can I use Gator Patch to fill linear cracks at the same time? Rubberized Hot Pour Filler is a better solution for this problem because it has better expansion properties due to its higher rubber content. Rubber crack filler will expand and contract with heat and cold; Gator Patch does not have the same flexibility, so using it to fill cracks could allow moisture to seep into your asphalt's foundation. Viscosity @ 77°F, ASTM D562 (Kreb's Stormer Unit) 125 min. Cure Time Dries for traffic in 2-4 hours in normal conditions; Cures completely in 24 hours. Clean-up Water and soap. Use solvent for dried material. Note Coverage up to 20 sq. ft. for patching alligatoring areas and up to 150 linear feet of 1/2" x 1/2" depth cracks per gallon. 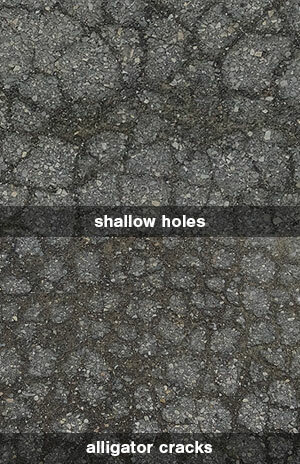 (Coverage will vary, depending on size and frequency of cracks in alligatored areas." A second application of Gator Patch will give cosmetic benefits in terms of smooth, consistent appearance and virtually hiding the outline of the cracks in the alligatored areas.